File this under “OMFG WHAT?!! !” I was walking through the local “health food” store today, and I spot this on the shelves. My immediate gut reaction: I NEED THIS IN MY BODY RIGHT NOW! My wife spots them about the same time as I do, and just as she starts to gauge my reaction, something to the effect of “uh oh” escapes her lips. YES. Uh oh, INDEED. I am a lover of both bacon and maple syrup. But in CHIP FORM? What?! My mind is blown. This is a new thing altogether. Read on for my review. So my wife doesn’t eat bacon or any kind of pig-related item. That’s cool. I do, however. Also cool. She scans the back of the package of chips and confirms there is no ACTUAL BACON or pig product in this product. Double win. We grab it and check out with a few other groceries. Fast forward about 30 seconds. I’m in the car, and I am ravenous. All of this writing crap makes you hungry, particularly when you are too busy to eat. I realize that I am in the driver’s seat of the car and opening up the bag of chips before my wife is even in her seat and buckling up. A split second later: The chips are in my body. I am immediately overwhelmed by the fact I am eating bacon covered in maple syrup — except it looks like a freakin’ handful of chips. We discuss. “It tastes smokey,” my wife says, not entirely convinced there’s any sort of bacon-like flavor in there. Of course, she hasn’t eaten real bacon in over a decade, so there’s that. I emphatically insist that “HOLY CRAP, this is bacon and maple syrup, but it’s chips too!” This is a revelation of great magnitude. In my mouth: the texture of the chips have a nice crispyness to them, like crisp bacon. But there’s also this great smokey/bacon flavor that my brain immediately equates with chomping down a strip of bacon. The texture fits too, which is important. There’s also a slightly sweet syrup flavor, like if you dipped your strip of bacon in the leftover drippings from your pancakes. Hence the imagery of pancakes and bacon on the package. Appropriate marketing? Truth in advertising. We (meaning 90% me) eat almost half of the bag before we get around the block. Suddenly I feel like I have actually eaten a plate of bacon. Perhaps less the calories, but still. “Gaahhhh. Can’t eat any more.” We get to our next destination. I eat another handful more. Then grab a few to take with me as I turn the car off. Hours later, I’m eating the last remnants of the bag as I write this. I have consumed perhaps (roughly estimated) 1050 calories worth of “maple bacon” chips today, which I say makes me a damn expert on the things at this point. I highly recommend NOT EATING A FULL BAG IN A SINGLE DAY. That said, I have yet to taste a bag of Kettle chips that was more ON POINT flavor-wise than these. 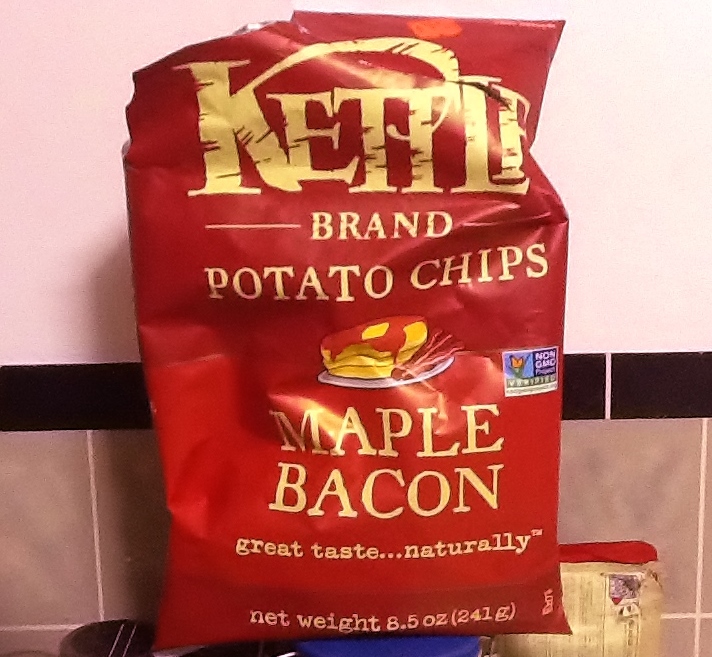 Maple Bacon chips, you get a resounding HOLY HELL YESSSSS double thumbs up in my book. This post has nothing to do with my NEW BOOK. But you should check that out anyway! This entry was posted in WTF Reviews and tagged junk food journalism, nathan meunier, random stuff, weird reviews, what?, WTF reviews by nmeunier. Bookmark the permalink.